Posted by FormSmarts on Jun 4, 2009 at 7:28 pm in form handler. This is a vast improvement! The fonts are a little large yet, in the email and could be reduced a bit. PDF would also be a welcome option. Thank you! When or how can we enlarge the HTML message? 20% bigger would be fine. I tried changing the settings to rich text/html and it would never remember the change. So I switched from google Chrome to IE and it worked then. There is a known issue that prevents changing email format with some old versions of Apple Safari and it seems, Google Chrome. This has been fixed in the new version of our software that will come out this month. In the meantime, please use a recent version of Safari or another browser to change email format. What benefit would a PDF attachment give your over an HTML email? So as a basic member, non pro you can’t get Rich Text Responses? Could I see an example of what a form would look like in Rich Text Format? If I upgraded I could get Rich Text Responses, how many forms could I upload under one account as a pro member? Pro and Business members can get rich-text responses. Business members can also get responses in PDF. 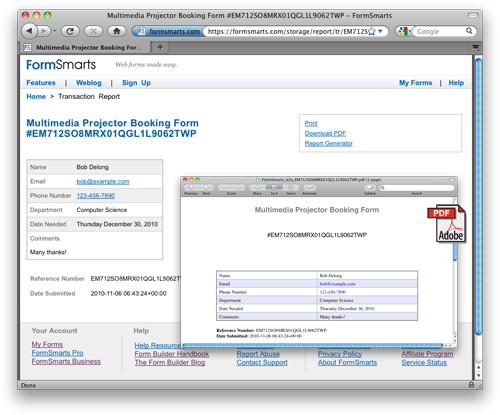 There is a screenshot at the top of this page showing a form response in rich-text format. There is no limit in the number of forms you can create under one Pro account. Rich Text (HTML) email Hungarian accents of other characters appear instead. What is the reason? This must be a character encoding issue. All emails from FormSmarts use the UTF-8 encoding, which allows the encoding of all character sets. Your email client is probably trying to use another encoding to decode the email content, hence the rendering issue. In your email client, there must be a View option in the main menu that will allow you to change the Character Encoding to Unicode (UTF-8).